Easter is on it’s way. And you know what that means…? Chocolate, and lots of it! Well, how about making a guilt free Easter treat this year and ditch that commercial overly processed stuff. 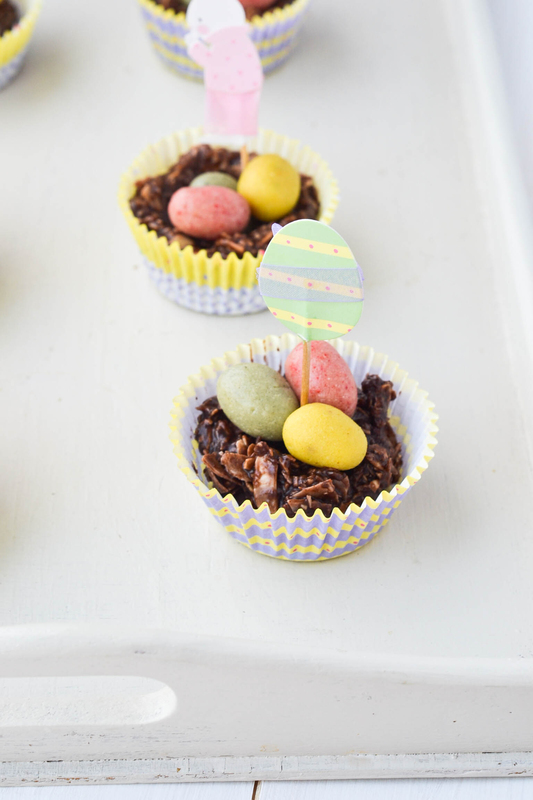 I give you , Chocolate Easter Egg Nests! These ones are a slightly healthier twist on the classic and are raw, vegan, gluten and dairy free. You can add anything you like into the nests – how about small protein balls from last months post, or try these home made Marzipan eggs below. Good luck and here’s to a happy, healthy Easter. Melt the coconut oil on a low heat and mix with the honey and cacao powder to form a chocolate sauce. Pour over the chocolate sauce and stir until everything is completely coated. Place the bowl in the fridge for about 5 minutes to let the chocolate cool and the mixture to thicken slightly. Divide the mixture into 8 cupcake cases (about 2 tbsp in each case) and then form into a nest shape with the back of a spoon or your thumb. To make raw marzipan, mix the ground almonds and honey in a food processor until it becomes dense and balls together. Don’t over mix or it will release too much oil. Add more honey if needed, until the mixture resembles marzipan and can be shaped like a dough. Split into 3 portions and mix the various food colourings in separately. Spirulina powder to make green, Turmeric to make yellow and dried strawberry powder to make pink. Roll the marzipan into a small ball then press into an egg shape. Leave in the fridge to firm up. Optional: Make the chocolate speckled effect by mixing the cocoa powder and vanilla extract together in a small bowl. Dip a clean paintbrush (not used on paint!) into the chocolate and gently tap on top of the marzipan eggs to create specks of chocolate. Return to the fridge to set. Thanks to the Wallflower Kitchen for this awesome recipe, we’ll be serving these nests at the Basecamp next week.